For the majority of presentations I conduct, I administer an on-line anonymous survey to get a better feel for what’s going on inside the organization. Finally, question three inquires about, “The attitude of those with whom you come in contact on a daily basis?” That scope involves everyone else we bump into, such as clerks, attendants, or phone reps, in effect the river of population flowing across our paths in a typical 24-hour period. 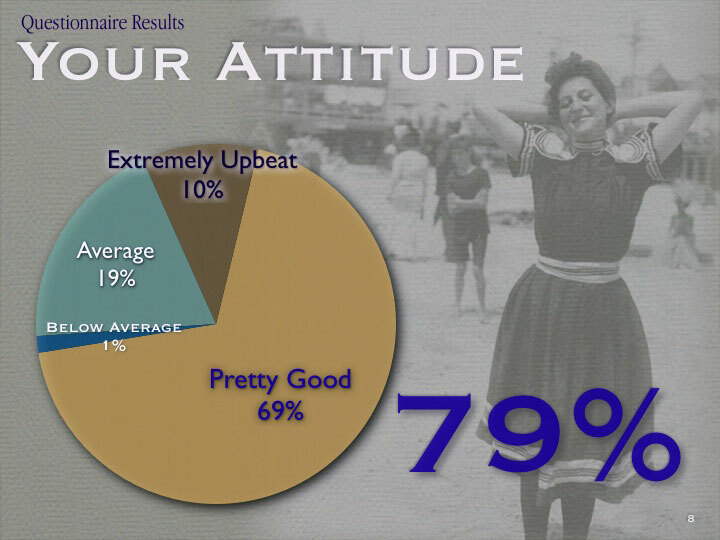 Using the same measuring scale, we sense that only about 31 percent of “those people” possess a “pretty good” or “extremely upbeat” outlook. To spin that yet one more way, we feel that only about one out of three, or one-third, of everyone we meet has a better-than-average attitude. Each of us feels we’re personally doing pretty well, and the folks in the circles in which we travel are holding their own. However, we seem to be pretty judgmental about everyone else, assuming that they really need to get their acts together (which they are, of course, assuming about us). The hitch in the get along is that attitude is transparent and contagious. We can spot a “negative person” instantly. His supposed attitude is loudly broadcast via body language, facial expressions, even tone of voice. We return those perceptions without thought, making countless assumptions, which we communicate. The drawback is, as evidenced here, we might not be responding to what’s really going on inside of them, as much as to what’s occurring within us. While at the gas station, or bank, or simply standing in line at the grocery store, we have a tendency to assume, “I’m doing okay – but these yokels around me, what’s their problem?” The deal is they’re looking at us, and doing the same thing; creating an infinite, expanding loop of negative feedback. It can’t hurt to judge less and assume better; we’ll all find ourselves surrounded by a better class of people, who were actually there the whole time.